Dowel joints are one of the easiest - and cheapest - methods of fastening two pieces of wood together. The technique is ideal for joining two flat pieces together to form a larger flat surface (as used in the TV cabinet project). Draw a line down the middle of each surface to be joined. This must be exactly the same on both pieces of wood, otherwise when they are joined there will be a step at the join. Once this line has been drawn, using a set square mark lines across the grain of the wood (see second diagram). The intersection of the length and width lines show where the dowel holes will be drawn. There is no hard and fast rule for how many dowels should be used. However, the heavier the weight of whatever will be on the surface, the more dowels should be used. Typically, one dowel per foot is a good rule (with a minimum of two). Once these lines have been drawn you can then proceed to drill the holes at the marked intersections. The drill bit used should match the diameter of the dowel beingb used, thus ensuring a tight fit. As for the dowel itself, you can either make your own small dowels from a longer length, or you can buy dowel made specifically for this reason. The latter option is a far better solution, as the small dowels are beveled at the ends to make it easier to but them in the holes, and are ribbed to allow the glue to bond more efficiently. Each hole should be just over half as deep as the length of the dowel being used. Unclamp the two pieces and push them together, ensuring that the two top markings are facing up. Once done, clamp tightly overnight. Be careful when you clamp them to make sure that both pieces remain flat and do not try and warp upwards. To avoid this, it may be necessary to clamp the entire piece down to a flat surface. Slotted Tenon joints are typically used as a method of fixing shelving into a unit's shelf walls. However, it can also be used for a number of other purposes. The idea of a Slotted Tenon oint is that only one of the two pieces of wood needs to be odified in order to attain a good, tight fit. To do this, one iece has a slot made into it this the same width as the thickness of the second piece of wood. This latter piece of wood can then be pushed into the groove, making a strong, right-angled join. Be careful when making the slot to ensure that it is not too wide, otherwise the joint will not be tight enough to work. It is far better to start with too tight a groove and widen it. A router is not always the best tool to use however. If the groove is to hold a piece of 1/4 inch (or smaller) plywood, you should use a circular saw instead, changing the depth of cut to as little as 1/4 inch. This smaller cut is ideal when making the joint for a back panel of a cabinet, such as a bedside cabinet. The dovetail joint is possibly the best joint that you can use to join two pieces of wood together at a right angle. Not only is it a very strong joint, but it also adds to the appeal of the woodworking project. Even better; everyone "knows" that a dovetail joint is hard to do, and so people will be even more impressed with your handiwork! While creating a traditional dovetail joint is not too difficult, it does take quite a long time; using a router speeds up this process considerably. The purists among you should stop reading now as you will not like this method at all...sorry! The simplest way to create dovetail joints is to use a router and a dovetail template jig. The latter is available from any good home improvement store and can cost as little as $70. It's well worth the investment if you plan on doing many dovetail joints in the future. Clamp the front of the drawer and one side into the dovetail machine as follows: the left side of the drawer should be clamped under the front clamp (pointing upwards towards the template) with the inside of the drawer pointing out; the front of the drawer - again with the inside pointing out -should be clamped under the top clamp so that it butts up against the left drawer (see the second diagram). These two pieces should be staggered slightly, rather than being aligned exactly. The precise measurement will depend upon the particular dovetail machine that you are using, and this distance will be supplied with its manual. 7/16 inch. Once everything is tightly clamped in place, use the router to cut around the template, following the direction of the arrows in diagram two. Once this is complete, the end result should look like diagram three. Dovetail A should be matched with slot B and so on. In addition to the router-based method of creating dovetails, it is also possible to make these manually. The common misconception about dovetail joints is that they are very hard to make. They are not. However, making manual dovetails does take a considerable amount of time and patience when compared to the router-based method, although the satisfaction level is higher too! The optimum slope of a dovetail joint depends upon the type of wood you are using. Softwoods should have a slope ration of 1 in 6, while hardwoods should have a 1 in 8 angle: that is one "unit" in from the side for every 8 units along the length of the wood. It is worth making a dovetail template to each of these proportions if you intend to make a number of dovetail joints. Not only will it speed the process up somewhat, but it will also ensure a uniformity between the joints. 1. Set the marker gauge to the thickness of the Tail wood, and mark this thickness all around the Socket piece. Then set the gauge to the thickness of the Socket wood, and mark all around the Tail piece. 2. On the end of the Tail wood, draw a line across the end that is half the thickness of the socket wood. For example, if the Socket wood is 1" thick, this line will be drawn 1/2" in from the end of the Tail piece. Repeat this for the other end of the tail piece as well, so that you have a matching line. 3. Measure the distance between these two lines and subtract 1/4" for each pin, less one. For example, if you plan to have six pins, and the distance between the two end lines is 7 1/4", subtract FIVE (ie six, less one) 1/4" gaps. The result is 6". Then, divide this number by the number of pins that you want (in this case six) to ascertain the size of each tail (in this case 1"). So what we now have is six pins, each 1" wide, with a gap of 1/4" between each one. 4. Once these end lines have all been draw out, mark out the tail slopes (at either a 1 in 8 or 1 in 6 ratio, depending on the wood used). 5. Saw out the tails. To do this, clamp the wood vertically, and at a slight angle so that the saw cut is vertical, rather than the wood itself. This makes cutting the desired angle far easier. If the saw cut moves slightly away from the desired angle, do not worry too much. Continue along the new line as it is more important to have smooth joints than it is to have them absolutely identical. 6. One the tails have been cut out, clamp the Socket piece vertically in a vice. Then, using the Tail wood as a template, mark out the shape of the Socket pins on the end of the Socket wood. Once this is done (and it must be very accurate), draw these lines down to the thickness line done in step 1. 7. Cut out the Socket pins, being very careful not to cut beyond the line. It is better to err on the side of caution, cutting just in the waster wood, and then neaten up the cut line with a chisel later. Once you cut into the good side of the joint (ie not the waste) then the joint won't work well. 8. Once the pins have been cut out it is time to glue the two pieces together. Before you do this, however, gently push the two pieces together and make any minor adjustments to the joint. Note that the joint should be very stiff and it is not advisable to push the joint completely together until you are ready to glue. A tenon and mortise joint is one of the classic joints that every self-respecting woodworker should know. It is the fundamental joint that has provided the basis of more recent joints such as the finger joint. When reading the below explanation, keep in mind that the Tenon is the piece of wood that slots inside of the mortise (which has a hole cut into it that matches the size of the tenon). 1. Calculate the size of the tenon joint. The size of the tenon is the same as the width (not depth) of the mortise wood. So, if the mortise is 2" wide, the tenon will be 2" long. Mark all around the tenon. 2. Calculate the width of the mortise. As above, this hole is relational to the size of the tenon wood. If the tenon wood is 2" wide, then the mortise will be 2" long. 3. Mark out the width of the mortise. The width of the mortise is calculated as being 1/3 of the wood's thickness. Use a mortise gauge to mark both sides of this hole. Then, use this same measurement to mark the thickness of the tenon piece, thus reducing the risk of introducing an error. 4. Once both pieces are marked out to your satisfaction, it is time to begin the cutting process. 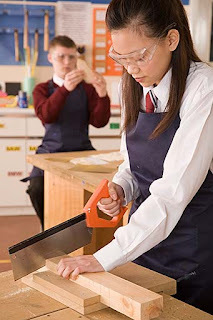 Use a tenon saw (obviously!) to cut the waste away from both sides of the tenon. Be very careful that you do not cut into the tenon itself. Although it is tem to cut straight down into the tenon, a safer way is to cut at a 45 degree angle, as shown in the diagram, before finally cutting in a horizontal manner. Doing this reduces the risk of cutting into the tenon on the side furthest away from you (see diagram). 5. Cutting the mortise requires a little more delicacy. Start in the middle of the mortise and cut down with the chisel about 1/4". Then, move the chisel backwards about 1/8" and repeat the process; and so on. Do not move back all the way to the end of the mortise, but instead leave about 1/8" untouched at either end. Once you have done the entire length of the mortise, scrape out the loosened waste wood. Then begin again, cutting down another 1/4" and so on. Once you are down to just over half-way down into the joint, turn the wood over and start in from the other side. 6. Once the hole is made, clean up both ends, cutting back that extra 1/8". 7. Finally, glue the tenon into the mortise. If the fit is less than perfect, use small wedges to make it more solid (see diagram).